I've been a Doctor Who fan for as long as I can remember. One of my earliest memories of the series is Mawdryn Undead. Growing up with the Peter Davison era, I have a certain fondness for that time and his Doctor, though I still maintain that Tom Baker is the definitive! 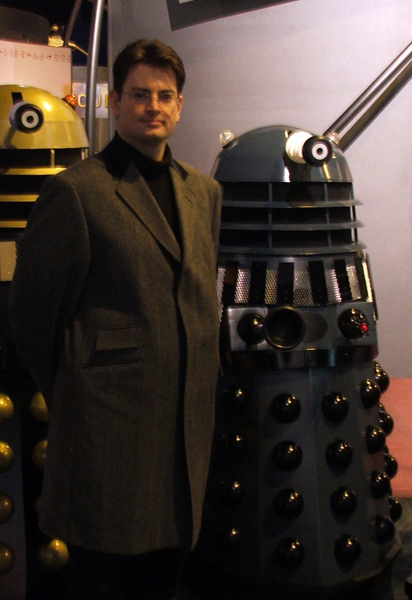 I'm as obsessed with Daleks as I am the show itself and enjoy collecting them. I'm also an avid science-fiction reader, and one of the contributors to the book You and Who (vol1). In addition to being a lifelong Doctor Who fan, I am also a digital artist, illustrator and electronic musician. My lifelong passion for science-fiction art finally came to fruition in 2010, when I started working on my own SF-inspired digital paintings (including the Dalek featured on the homepage). My artwork often goes hand-in-hand with my music. I have been producing instrumental electronic music under the name of “The Light Dreams” since 2006. What started out as a personal hobby gradually evolved into something I was confident in releasing independently, and I'm now proud to have a growing discography of atmospheric and thought-provoking albums (with the occasional Who reference in the song titles!). In 2012 I was invited to be honorary musician for the Initiative for Interstellar Studies. Please send me an email if you wish to contact me for general correspondence or anything relating to the content of this website. No advertising queries or press releases please.